“What’s the best thing that’s happened between England and Ireland?” Ask any Irishman and he will have no hesitation in saying “The Irish Sea”. There is not much love here for The Old Blighty. The Irish are a hard-drinking, fun-loving people whose national pastime is to clobber each other periodically and then make up jokes about themselves. Northern Ireland is no different and, though it conjures up vague recollections of the IRA, the Sein Fein, the Orange Marches, the Catholic-Protestant riots, the potato famines, the British brutalities and so on, it is nonetheless a delightful place to travel through. 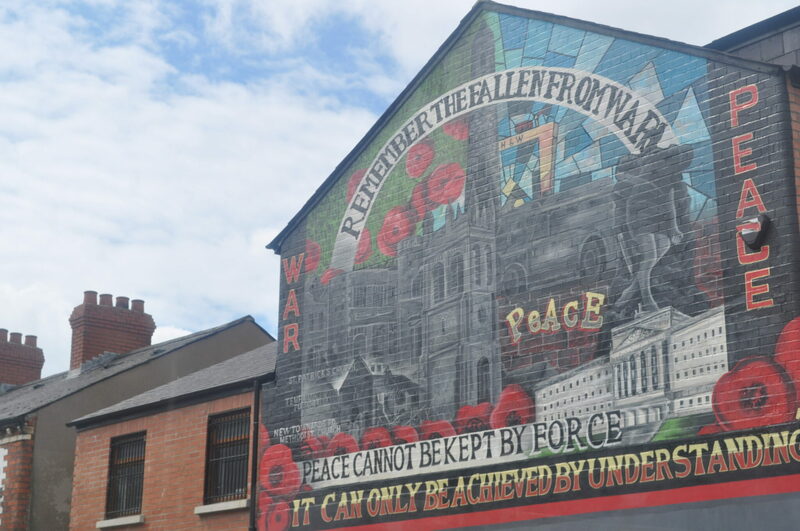 Belfast, the capital, is a modest city; pretty only in patches and slightly different from other European cities in that it has a very clear communal divide. The Catholics are more or less locked up in certain quarters and although nowhere in appearance like the Jewish ghettos of WW2, the tension along the edges is palpable, especially during the summer months when the Orange Marches become due on July 12th. The loud, oversized graffiti on blank walls and the huge monochromatic, sinister murals on the sides of buildings convey a grim message that all is not well in the Capital. But that story will have to wait till we reach N. Ireland’s second largest city – Londonderry or Derry as the locals will have it. Among the sights of Belfast is the Cave Hill overlooking the city, whose profile, as you leave the city by ship, resembles the face of a sleeping giant – a feature that inspired Jonathan Swift to brew up that immortal story of Gulliver’s Travels. 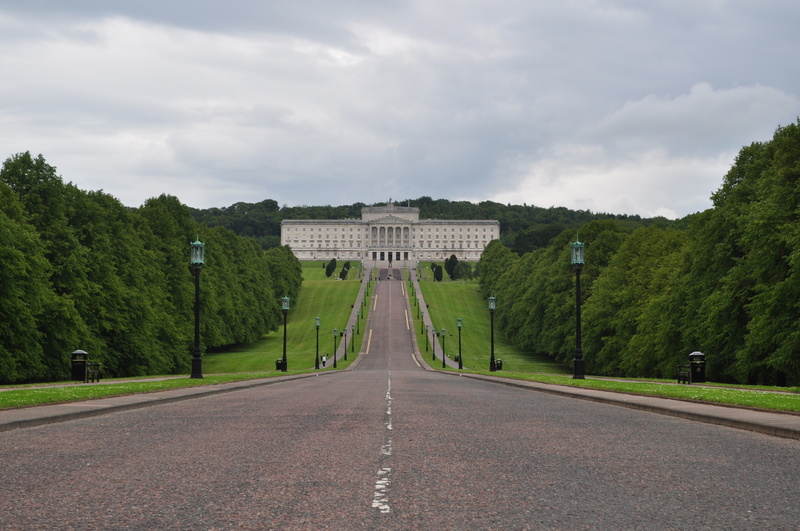 Stormont, the Parliament of N. Ireland is an imposing building set at the top of a magnificent cascading campus with none of those ugly barricades or gun touting security guards that are so common around Government buildings here. Albert Tower in the Town Centre has a gentle unnoticeable tilt to one side but is nowhere as remarkable as the one at Pisa. Belfast has made a name for itself in the shipbuilding industry. The ill-fated Titanic and its sister ship Nordic were built here at the Harland & Wolff shipyard. The two mighty cranes, lovingly referred to as David and Goliath, that did the job are still standing and are now going to be used for the more leisurely pursuit of bungee jumping. Our tourist guide cracked us all up by asking all Englishmen to put their hands up and then jokingly pointing to them as being the real culprits for the Titanic tragedy. “The captain was an Englishman and the man at the wheel was a Scot, so don’t blame the Irish for your goof up”, she says. Next, we hit the road wanting to take the Coastal route – voted by motorists amongst the top ten ‘most scenic’ – to the Giant’s Causeway on the shores of the North Sea. Somehow and rather fortuitously we got lost and drifted off into the interior instead – a mistake that we didn’t regret one bit. (Anyway, the country is so small; driving conditions so good and the days so long that recovering a few lost hours was not a serious problem at all). It is the green rolling landscape that has earned for the country the sobriquet – the Emerald Island, and the experience was vertiginous. You were either going up or rolling down. As far as the eye could see there was not a yard of a horizontal plane for reference. It was like being in the middle of a green choppy sea that had suddenly frozen all over, under medusa’s spell. Our GPS – that trusted, faithful old friend – after a groggy and uncertain start finally found its Irish bearings and put us back on the Coastal Road and our vote was immediately cast along expected lines. The beauty of the Coastal Road is in the grandeur of its canvas. There is no peek-a-boo here; none of that ” now-you-see-it; now-you-don’t” stuff. The entire panorama is majestically open in front of you, giving you enough time to soak in and relish all the details, with the cloudy grey of the North Sea to one side and the emerald green of the rolling hills on the other, and occasionally dotted by tiny fishing villages that lost none of their charm even on closer examination. Lunch in a quaint little town – Cushandale – became a bit of an embarrassment. In spite of its delicious taste, we managed to finish only about half of it and had to pretend we were pressed for time. There are only so many potatoes that you can eat. Along the drive, a word of caution of a personal nature is necessary. It becomes so exasperatingly cold that searching for and targeting the right ‘loo” spots can become a major pastime. There are public toilets in all villages, of course, if you can hold on; and they are even given annual awards for maintenance – an absurd idea for us Indians. 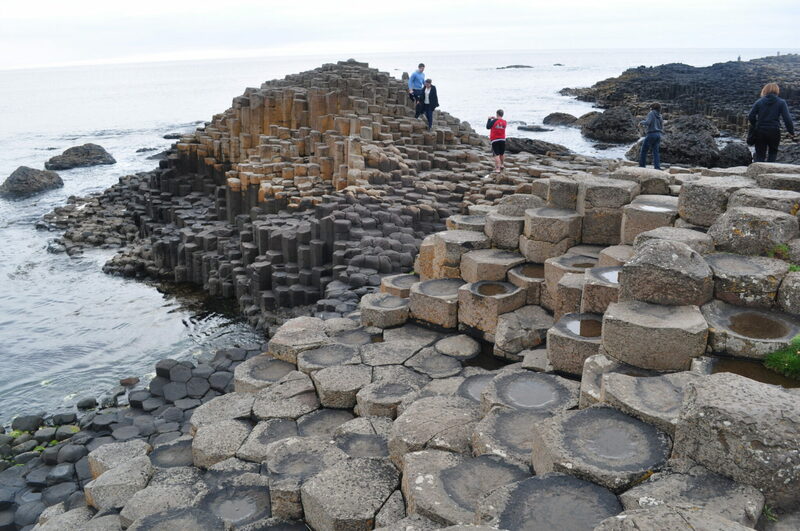 The Giant’s Causeway is one of the natural wonders of the world. By some freak volcanic activity, hexagonal rocks, nearly all of a uniform size, jut out to different heights along the shores of the North Sea for a distance of about half a kilometre. Both nature and man have contrived it in a manner that doesn’t permit any sneak previews. So we had to buy entry tickets to see them and it proved well worth every penny. The waters around here are also the site where the ponderous ships of the Spanish Armada were shipwrecked. In many ways, the walled city of Londonderry, the 4th largest on the Island, on the Foyle River, is different from Belfast. It is a fiercely Irish city, with signs everywhere of its militant proclivity. Here too, the building sides are painted with huge murals that keep reminding you that you are in the midst of a turbulent region. The city’s demographic balance, unlike as in Belfast, is heavily tilted in favour of the Catholics, whose political leanings are more inclined towards Nationalism and therefore in direct conflict with the views in Belfast. A brief flashback on the genesis of the current political problems may be required here. Long before the English arrived on the island, Ireland was a Catholic country under the patronage of St.Patrick. The English Crown became oppressively assertive after Henry VIII’s schism with Rome and the ‘Reformation’ that followed. It couldn’t get a foothold in Ireland that had the support of Spain and Rome. In the meantime, the English policy of ‘Plantation’ brought in thousands of Scottish and English Protestant settlers. With the role of religion as a new divisive force, the Sectarian conflict became a recurrent theme in Irish history. In 1613, after overthrowing the Catholic majority in Parliament, the Protestants began creating exclusive boroughs for the new settlers. In 1801 the Parliament itself was abolished with the island becoming a part of United Kingdom of Great Britain. In 1922, after the Irish War of Independence, the larger part of the island seceded from the UK to become the Irish Free State. Northern Ireland opted to remain within the UK. The Irish civil war soon followed and the region has since been dominated by the sporadic sectarian conflict between nationalist Catholics and the unionist Protestants and is kept alive by the adamancy of the latter group who insist on celebrating their victory of 400 years ago over the Catholics by conducting the much hated Orange Marches. The rest of our trip took us through some lovely little towns with unforgettable names – Enniskillen, Portadown, Dungannon, Lisburn, Newcastle, Antrim – with an overall impression of a people who love to talk. In parting, I can’t resist this little repartee. When asked to compare an Englishman with his photograph, one particular Irishman thoughtfully rubbed his chin and suggested: “Well, I guess a photograph is fully developed”.